We've been enjoying some glorious weather here for the past week and more. The fog has been mostly absent and the weather has been gloriously warm during the day and delightfully cool at night. I'm sorry to have to say that when I know that some of the garden bloggers that I follow have already experienced the first killing frost of the season. On the other hand I don't feel so bad about that when I think back to the many summers when I read that those bloggers were harvesting summer veggies when my garden and I were shivering through chilly nights and foggy days in May, June, July and even August and this year we even had unusually foggy days in September. So given that don't be too surprised to see that my first harvest post for November still features a parade of ripe peppers. The parade isn't going to last much longer though. 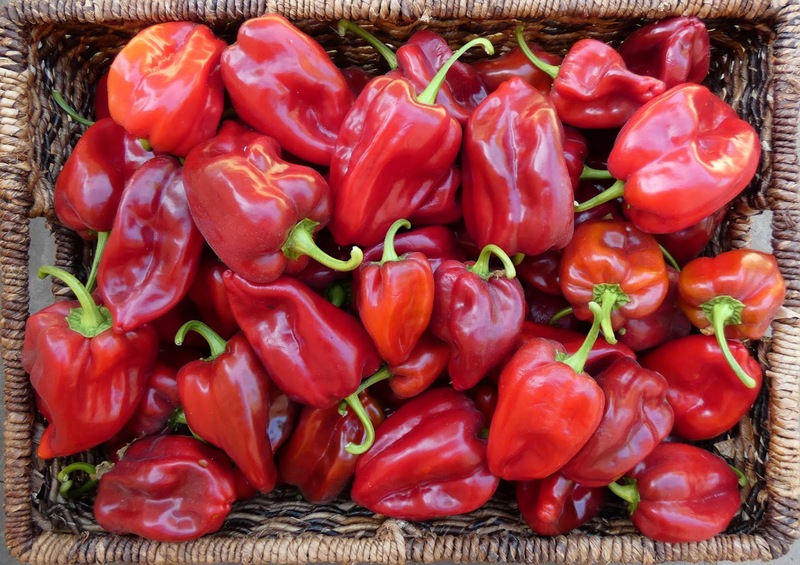 This is the final harvest of Criolla de Cocina peppers. The plants were pretty well done in by powdery mildew and there were only a few green peppers left so I picked everything and cut down the plants. Florina seems to be more resistant to powdery mildew than some of the other peppers I'm growing this year so this is not quite the final harvest but after this there's just a few peppers left on the plants. 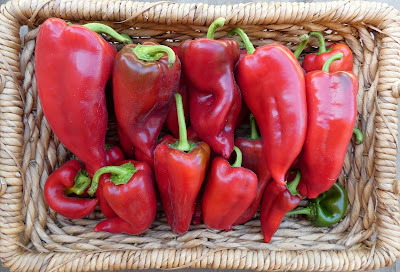 Ajvarski is also pretty susceptible to PM so this is almost the last harvest, there's a few peppers left that weren't quite ripe so I left them in the garden. Ometepe is a late ripening pepper and unfortunately it is susceptible to PM so even though there are still a lot of peppers left in the garden I'll have to pick the rest of them soon because the plants are dying quickly and the quality of the peppers is suffering. Almost the end for Rosso Dolce da Appendere. I cut down all the plants except one that had 3 underripe peppers left. It's a different story for the seasoning peppers. 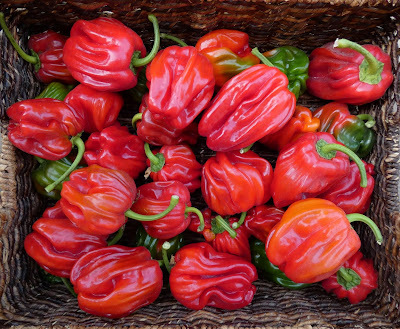 Most of the baccatum and chinense peppers ripen late so the harvests are either in full swing or just getting started. 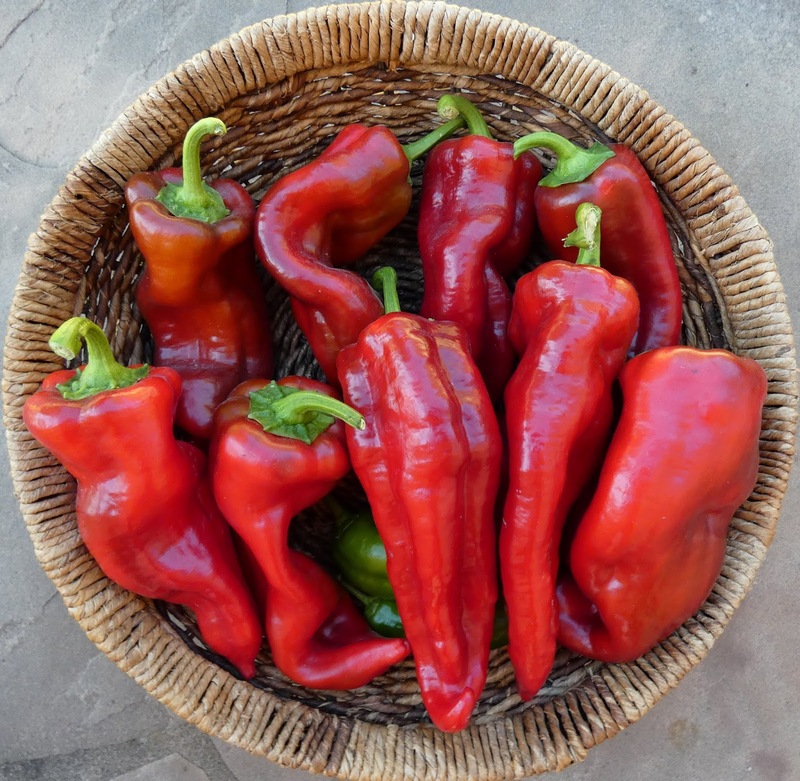 The baccatum peppers are quite resistant to powdery mildew and cold weather so the harvests should continue for a while. But the chinense peppers aren't such a happy story. This is the last time I'll be growing Caribbean Season because they don't set very many peppers. The plants are in full bloom right now but with just a few peppers. They are much less tolerant to cold weather than the baccatum peppers so as soon as the weather turns cold they will be goners. Habanada was very productive last year but this year is being stingy and it seems to be sporting some sort of fungal infection so I don't have a lot of hope for it either this year. 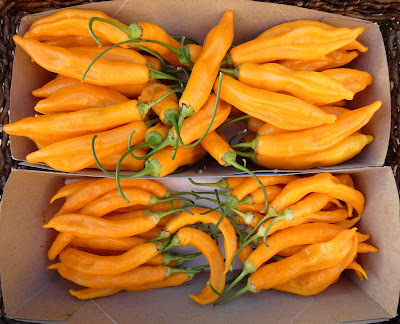 I should stick with baccatum peppers, they are so much more reliable. 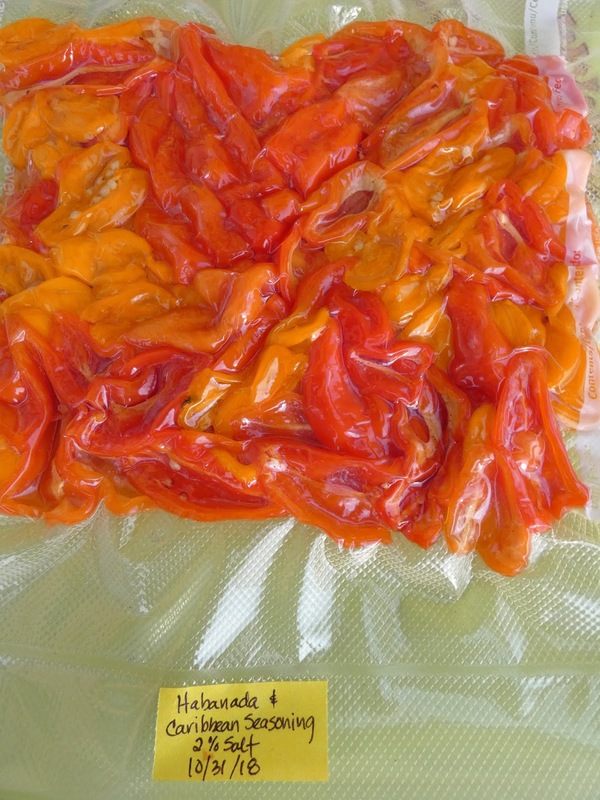 I've been fermenting a lot of the peppers, both sweet and hot, and am trying a new to me method of fermenting in vacuum sealed bags that I read about in The Noma Guide to Fermentation. 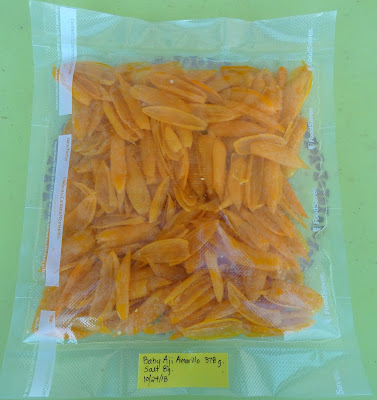 It is turning out to be a great way to ferment small batches of peppers or when I don't have an air-lock system available. It's super easy, just toss the peppers with salt (2% the weight of the peppers), arrange them in the bag, vacuum seal, and wait. You know that the fermentation is progressing well when the bag loosens up and then starts to puff up. 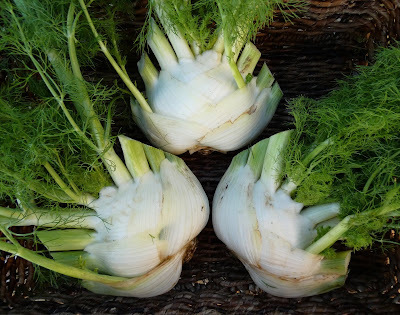 The summer sown fennel was past ready to harvest. Some of the outside blades are a bit rough but still good after some trimming. The inner parts of the bulbs are quite nice. The Pink Plume celery keeps giving and giving. That's over a pound of trimmed stalks much of which went into a cream of celery soup with a garnish of walnuts, raisins, and parmesan. 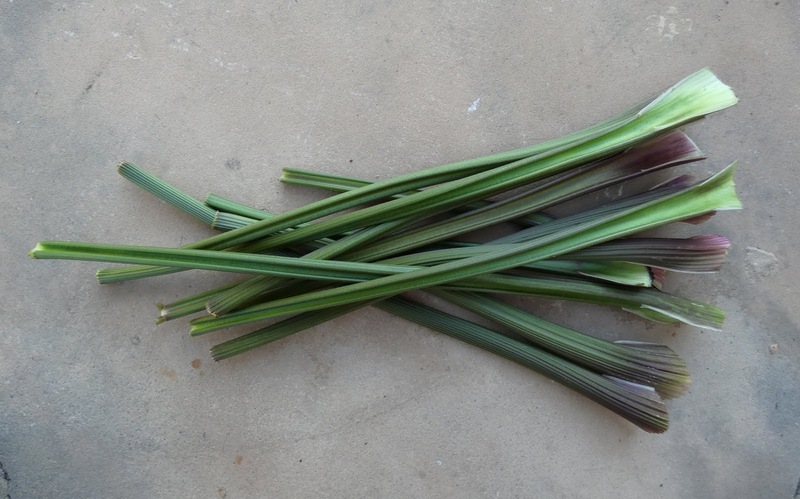 Next up I'm going to make a celery and date salad that I remember making a few years ago and forgot about until it popped into my head when I spied a package of dates at the store. That's the latest from my garden. Now I've got to get outside and enjoy more of the perfect fall weather while the sun is out. That's the only problem with having the best weather at this time of year, the days are too short. I'm always interested to see what you're growing and harvesting. You're in the Monterey area? What Sunset zone? Some of the veggies you grow in the summer only do well for me in winter in zone 24. I'm not far from Monterey but the weather is different from there because I'm tucked into a valley and further from the water. Sunset zone 16. There's a lot of marine influence here so summers tend to be cooler than farther inland, lots of morning and evening fog and a cooling breeze most of the time. Less fog in the fall so it tends to be warmer. That's too bad about the powdery mildew running through your pepper beds. Molds have just been terrible this year. Your peppers look amazing. I just wish I could get my husband to eat more them, but he only likes them in salsa or a pepper beef dish I make. And I love seeing your giant heads of fennel, so great. Powdery mildew is just a fact of life in my garden, it hits all sorts of veggies, some years are worse than others. Lucky me, my husband loves to eat peppers so I use them as much as possible. "the only problem with having the best weather at this time of year, the days are too short." That's funny! But true! It's dark by 5 PM when I would still like to be in the garden. I have to keep the flashlight handy to pick herbs and such when I prepare dinner. After a long hot and humid summer I was ready for the first frosts here! I've never seen PM on peppers but I did have it on basil this year which was a first for me. 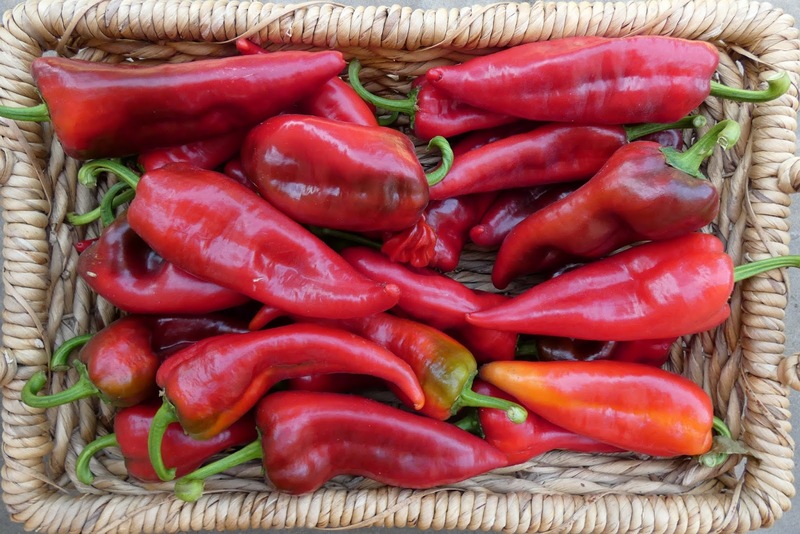 That sounds like a great way to ferment smaller batches of peppers. We have the Foodsaver too, so I'll have to try it next year. And it sounds like I need to check out the book. Thanks for the tips! 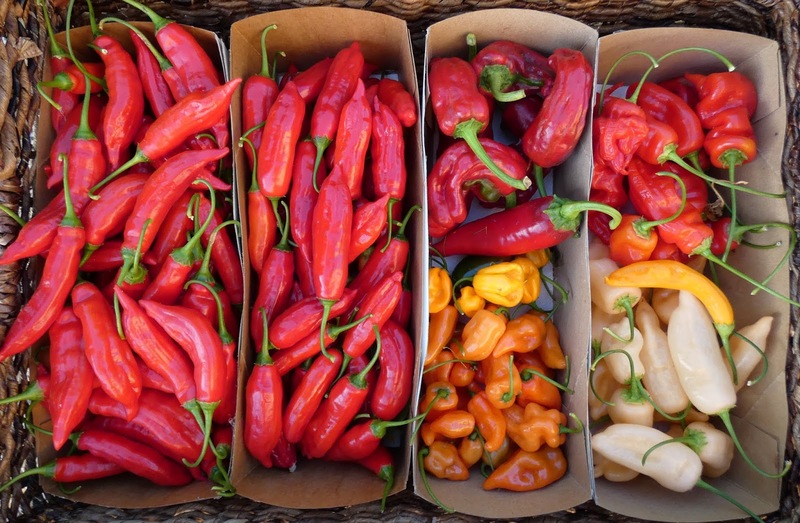 Such a great range of peppers and an interesting way to ferment them as well. I am trying to pickle chillis for the first time ever this year as I have more than I can really dry. That's a lot of peppers, despite the mildew problem. They always look so good en masse like this! We have had no success with bulbing fennel this year, so look at your with a little envy...always another year next year! I can only dream about my peppers outlasting the cold to be affected by PM. That fermentation method is really interesting and simple; I'm going to suggest it to You-Know-Who. So. Many. Peppers. :) It's hard to believe you had any issues at all in your garden this year! And that's such an interesting way of fermenting...do keep us updated on how well this method works.